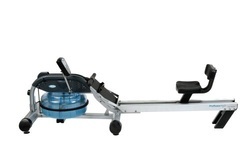 The Prorower RX-950 is a commercial grade rowing machine from H2O Fitness - and a pretty good one at that! It comes up against from stiff competition from the likes of Waterrower and First Degree (see our recommendations below) but apart from a slightly disappointing display and console, it has no problem holding its own. If you're not familiar with water resistant rowers you can read up on the different types here, but basically this model uses a tank containing water and paddles to create the resistance. While club rowers (the guys who race on real rivers and lakes) are loyal to air machines, many fitness rowers and users of indoor rowers love the simplicity of using water. One benefit is that you don't have to alter the resistance settings as with air and magnetic models, if you want a tough workout just row harder. The faster you row the more the water resists the movement of the paddles in the tank. And when you slow down, the resistance eases off allowing for an easier ride. 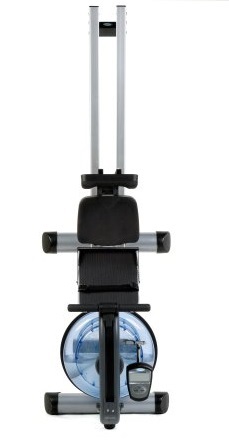 The first thing you'll notice when you get on this machine, is that it is absolutely rock-solid. The machine itself weighs in at 115 pounds, and thanks to the quality construction and materials used, will support a whopping 550 pound user! That's just about as heavy as any rowing machine on the market can handle. The twin rail track makes for a very smooth and quiet row. The seat is comfortable, and for extra you can get a seat with a lumbar support. We're not sure that most rowers would really need this, but why not just add it to the standard model instead of making it an optional extra? A really great feature are the footrests. Often a good rower can be let down by straps that don't hold your feet in place and make it difficult to row if they slip. 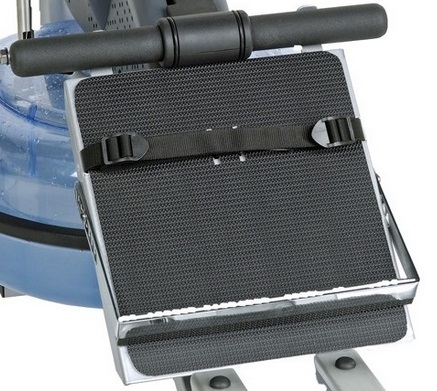 But the RX-950 comes with adjustable rests for comfort and straps that secure the feet in place - no slippage at all. But, bear in mind it's a single foot pad where your feet are held together. It doesn't really make much difference, but many prefer two separate pads for each foot. The one thing that is a bit of a disappointment is the monitor. While its large screen is easy to read when working out, we feel the functions are bit limited for a rower costing this much. 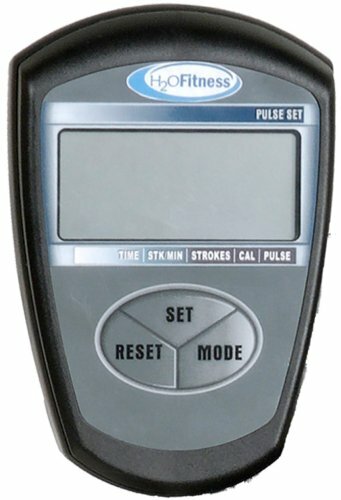 Other models in direct competition come with PC compatible monitors for performance tracking, race boat and heart rate programs. Yes it does come with a receiver for a heart rate monitor (transmitter not included). However, this shouldn't in our view put you off getting this model. Best Price: Seems to be unavailable at present. 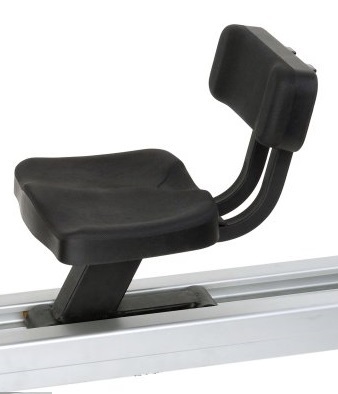 A very sturdy model - rock solid and will support a rower of up to 550lbs! 89" x 30" x 26"
If you're looking for a water/ fluid machine for a similar price, we also rate the Waterrower Natural with a score of 85%. It's a very different model with its natural wood frame but has many devotees. 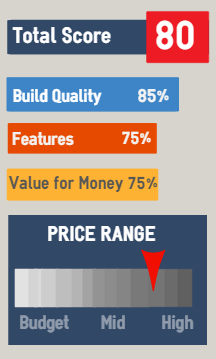 If you think your budget won't stretch to over a $1,000, H2O's little brother the RX-750 is a good choice.